Graduate in Sociology from the Autonomous University of Barcelona (UAB). He participated in the ORDIT programme for leadership and social transformation, organized by the Institute of Governance and Public Policies (IGOP) of the Autonomous University of Barcelona and the Fundació Jaume Bofill, and in the Vicens Vives leadership and civic-engagement programme at ESADE. Since 2011, but currently on leave of absence, he has worked as a product manager for professional training in the company Aqua Development Network. He has participated in the design of various vocational training qualifications associated with the water and environmental sectors. In the areas of work and training for young people, he has coordinated youth social and labour mediation projects and organized vocational workshops for young people. 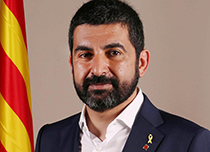 A member of the Parliament of Catalonia since 2015, he has been spokesperson for the Work Committee and rapporteur of the Law on the Guaranteed Minimum Income and Social Protection Agency of Catalonia. He has also been a councillor in Granollers City Council since 2015. He is a member of Esquerra Republicana de Catalunya (ERC) and a member of the UGT of Catalonia and of Avalot, of which he was secretary of organization and national spokesperson. As spokesperson of Avalot, he participated in the national secretariat of the UGT of Catalonia and promoted the popular legislative initiative of Urgent Housing Measures, the Agreement on Measures for Employment of Young People, and the collection of signatures to raise the interprofessional minimum wage. He is a member of the Esplai Guai de Palou, the Club Natació Granollers, and the Fundació Josep Comaposada Sindicalistes Solidaris, with whom he has collaborated on various cooperation projects involving the Maghreb and Central America. He has participated in youth association platforms, the Youth Council of Barcelona and the National Youth Council of Catalonia.